In 1989, Johns combined her talents with three other partners, including a fabric dyer and silk screener to form Fabric Effects, Inc. Located in New York City, this full service fabric modification shop served the theater, fashion and home furnishing industries. Here Johns worked with designers developing their lines for companies like Polo Ralph Lauren, Nike, Reebok, and many others. Other projects included painting costumes for the Broadway production of Beauty and the Beast, and Guys and Dolls, and concert tours for The Rolling Stones and The Artist Formally Known as Prince. 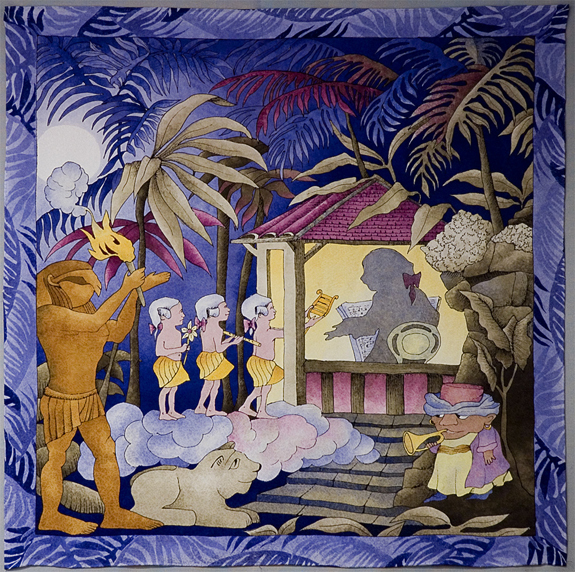 design; a 36" square scarf based on Maurice Sendak's design for The Magic Flute. For purchase and other information please contact us at Out Of The Night Kitchen.